Today's featured friend, Social Graces, is generously donating the entire paper suite for the event. Creative Director Erin Pfister took a minute from her day to chat about the ever wonderful paper business.....We particularly love her advice to brides - enjoy! 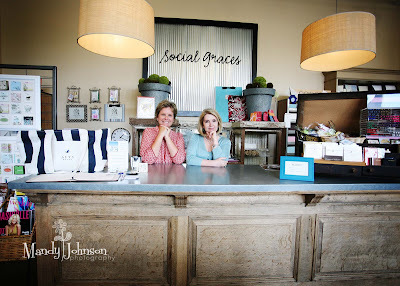 Social Graces was originally opened in 2000, but was sold to two new owners, Rebecca Climer and Teresa Palmer, last August. Who IS Social Graces, and who does what? Owners Rebecca Climer and Teresa Palmer each have corporate jobs that require their full attention, but always find time to work on weekends or in their spare time. Erin Pfister is the Creative Director who oversees the merchandising, buying, advertising and offers custom design to customers. Darby Kemp has been with Social Graces for over 4 years as a salesperson & buyer while attending Belmont. Her knowledge of all products & skills with bridal orders is unmatchable. Amanda Moore, Cori LeCain, Laura Hutchinson, and Sterling Scott are salespeople who strive to provide the best customer service. Are you seeing trends or themes in design? Dark colors, like brown paired with tiffany blue, cream or gold. Another big trend is folders instead of the traditional inner and outer envelopes. There are a few lines that offer great flexibility in the use of pre-cut folders and inserts that can be customized with a little imagination. Who is your favorite collection right now? We have two favorites that we picked up at the New York Stationery Show this spring...Dauphine Press and Elum. Both are amazing letterpressed collections that are sure to fit either a traditional or more contemporary wedding theme. If you had one piece of advice regarding stationery for the bride, what would it be? Take your time in choosing the perfect stationery. Invitations are the first impression of the wedding and, for some invitees, the bride and groom themselves. They create a sense of expectation for those who receive them and, when they are well chosen, give an inkling about the style and personality of the couple. No element of the wedding celebration should be considered in isolation, so the invitations should be consistent with the overall tone of the wedding. It’s important to remember, too, that the invitations and other wedding correspondence are among the few tangible reminders of the wedding. Brides should begin to look for their wedding stationery as soon as the date and general theme are set. With the vast array of options that are available, it’s best to allow plenty of time for consideration. One visit to the stationer can yield dozens of equally attractive options. In your spare time, what do you do? Travel, spend time with friends, take Spanish and run. I love all things design - am always seeking inspiration from design blogs, magazines, and traveling to keep my mind full of new ideas. What is your vision for the Open House + Fashion Show? We hope to see many new faces that will see the importance of creating an overall look & theme for their wedding....from the dress to the invitations and decor. We can offer stationery suites in a variety of styles and price ranges to meet the desires of our customers. We strive to offer the best customer service and want to build relationships with people who come to us not only for their wedding needs, but for any gift or paper need in the future. Social Graces is located in the heart of Hillsboro Village at 1704 21st Ave South . This Weekend!! Augusta Jones Trunk Show!! !